Recent map shows progress of Opportunity Mars rover toward the large Victoria Crater. BOULDER, Colorado-It has been a long, hard drive on Mars for NASA's Opportunity rover. Wheeling across the open, parking lot-like dune fields of Meridiani Planum, the robot is nearing a major milestone: rolling up to "Victoria", a crater that is roughly half a mile (750 meters) wide and 230 feet (70 meters) deep. But before pulling up to the large crater, the robot is inspecting a smaller feature named Emma Dean, said Steve Squyres, science team leader of the Mars Exploration Rover mission and a space scientist at Cornell University in Ithaca, New York. "Emma Dean should be our last stop before we reach the rim of Victoria crater," Squyres told SPACE.com. "It's an important target, because it may excavate into material that was ejected from Victoria crater. As such, it may offer one of the best near-term chances we'll have to sample such material. Once we're done with Emma Dean, we're going to sprint for the rim of Victoria." Since Opportunity landed on Mars in January 2004, Victoria has been the destination of the machine for more than half the mission, noted Ray Arvidson of Washington University, St. Louis. Arvidson is deputy principal investigator for Opportunity and its twin rover, Spirit, half the planet away at Gusev Crater. Arvidson said in a NASA press statement today that examination of the rocks exposed in the walls of Victoria crater will greatly increase the understanding of past conditions on Mars and the role of water. "In particular, we are very interested in whether the rocks continue to show evidence for having been formed in shallow lakes," Arvidson stated. Scientists and ground controllers are "ready to hit Victoria with everything we've got," added Byron Jones, a rover mission manager at NASA's Jet Propulsion Laboratory (JPL) in Pasadena, California. Already, thanks to imagery taken from above Meridiani Planum by NASA's Mars Global Surveyor, rover operators know ahead of time what to expect at Victoria. Its crater walls expose a stack of rock layers approximately 100 to 130 feet (30 to 40 meters) thick. Once Opportunity is on the scene at the crater's rim, the robot will take a set of initial views into the feature. Using those images, Mars rover scientists and JPL engineers will plot the best route into the large crater. Opportunity has been traversing an annulus of dark material around Victoria, said William Farrand, a research scientist here at the Space Science Institute. He is also a member of the Mars Exploration Rover science team. "There had been some fears that this might be loose, tough to drive on soils, but it has turned out to be fairly well compacted and a good driving surface. We are planning on taking one more look at outcrop material before driving to the rim of Victoria crater," Farrand told SPACE.com. In the works is a strategy to study Victoria. High on the priority list, Farrand said, is finding a good vantage point for taking what should be a stunning color panorama of the crater. In the robot's drive around the rim of Victoria, a decision is forthcoming about wheeling Opportunity in a clockwise or counter-clockwise direction, from an orbital perspective, he added. "I think everyone on the team is pretty psyched to get to the rim of the crater and to get a rover's eye view of what's inside," Farrand said. 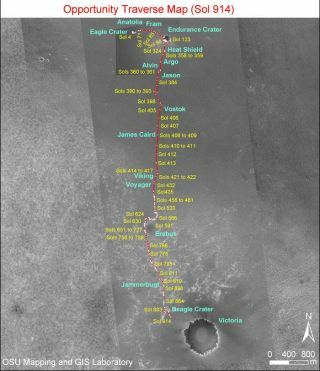 John Callas, JPL rover project manager, saluted the long list of accomplishments that both Spirit and Opportunity have chalked up since their respective touchdowns in January 2004. Each robot is showing some signs of aging, Callas explained. For instance, a joint in Opportunity's robot arm stalled last week as it was trying to start measurements on a trench it dug. "We can't say how long the rovers will last," he said, "but we will push to get the best possible science out of these national treasures as long as they keep operating. Victoria could very well be the most productive and exciting science of the entire mission." Meanwhile, at Spirit's exploration site within Gusev Crater, the rover recently experienced a software reset. Cause of the problem was thought to be an overworked central processing unit. Still, both Spirit and Opportunity are healthy in terms of an ability to continue work tasks in their individual winter science mode campaigns. The twin robots are also holding steady given available electrical power drawn from outstretched solar arrays.